Today was a great day to travel outside of the city of London. It started out a bit chilly and foggy, but by the time we all arrived to Salisbury Cathedral the sky had mostly cleared and was comfortable weather. 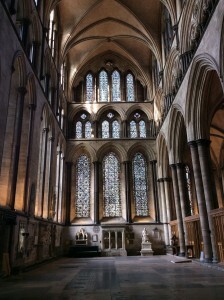 The gothic cathedral can be seen from the outside of the small city of Salisbury. It is located inside of the walls and the close and also beside the flood plain. We took a tour and ventured to the top of the spire and was able to view how the vaulting, the support beams, now the spire was constructed and a gorgeous view out into the city and the rolling hills beyond the city limits. Once we climbed all the way back down, we looked around the ground floor if the cathedral. One of many features that I love about it is the beautiful, ornate stain glass windows.